Chateau Soleil was created in 2005 when the vineyard was purchased by Stephan von Neipperg and Didier Miqueu. Chateau Soleil is located in what is known as the Saint Emilion Satellite Appellations. Starting with the 2016 vintage, Stephan von Neipperg was no longer involved with the winemaking or vineyard management. In 2018, GST Investissements purchased Chateau Soleil. GST Investissements was already familiar with the Bordeaux wine trade as they are the major shareholders of Vintex, a well-known negociant company headed by Philippe Larche. The 20-hectare vineyard of Chateau Soleil is planted to 80% Merlot, 10% Cabernet Franc and 10% Cabernet Sauvignon. On average, the vines are on average, 30 years of age. The vineyard is planted to a vine density of 5,700 vines per hectare. The terroir of Soleil is thin clay and gravel over limestone soil. The situation has their vines well placed on the peak of the plateau of Puisseguin. The vineyards are trellised using the traditional Guyot double system. Vineyard management techniques include cover-cropping, mechanical tilling of the soils, debudding, deleafing, and crop-thinning. All these efforts help control the yields at Chateau Soleil. Stephan von Neipperg is a huge proponent of naturally, self, sustainable vineyard management, Chateau Soleil is no exception. They never use any types of chemical fertilizers, insecticides or herbicides. To produce the wine of Chateau Soleil, the grapes are whole berry fermented. Vinification takes place in either 50 hectoliter or 100 hectoliter, epoxy lined, cement vats. There, the whole berry grapes are kept at the low temperature of 10 degrees Celsius in a pre-fermentation, cold soak, to increase the color, depth and extraction of the wine. Microbullage is used both under the cap during fermentation and during the process of barrel aging. Malolactic fermentation is conducted in barrel. The wine is aged on its lees, which are regularly stirred. The wine is aged in 50% new, French oak barrels for between 18 and 22 months. There are two second wines, Promesse Soleil and Croix du Rival. Close to 7,000 cases of Chateau Soleil are produced each vintage. The Right Bank property also produces a special, high-end cuvee, Chateau Soleil Le Rival which comes from a special 4 hectare block with old vines planted in 1952 and 1962. The vineyards are located in Lussac Saint Emilion. This 4 hectare parcel is the oldest vines from the 20 hectare vineyard of Soleil. The terroir is similar to some of the best soil in Saint Emilion with its blend of clay, gravel and limestone. The wine making is similar to what takes place at Soleil, but the yields are much lower for Le Rival. They can be under 20 hectoliters per hectare. Also, because the wine is much richer, the wine of Soleil Le Rival is aged in 100% new, French oak for between 18 and 24 months. On average, the production is close to 800 cases per year. 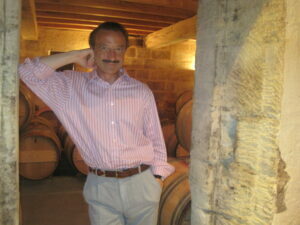 The production of both wines is ably managed by Stephan von Neipperg. Chateau Soleil is much better with at least 2-3 years of aging in good vintages. Young vintages can be decanted for 1 hour, allowing the wine to soften and open its perfume. Older vintages might need very little decanting, just enough to remove the sediment. Chateau Soleil offers its best drinking and should reach peak maturity between 3-10 years of age after the vintage. Chateau Soleil is best served at 15.5 degrees Celsius, 60 degrees Fahrenheit. The cool, almost cellar temperature gives the wine more freshness and lift. Young vintages can be decanted for up to 1 hour. This allows the wine to soften and open its perfume. Older vintages might need very little decanting, just enough to remove the sediment. Chateau Soleil is best paired with all types of classic meat dishes, veal, pork, beef, lamb, duck, game, roast chicken, roasted, braised and grilled dishes. Chateau Soleil is also good when matched with Asian dishes, rich fish courses like tuna, mushrooms and pasta. Dominated by 95% Merlot, with a strong licorice and black cherry nose. The wine is silky, lush and opulent, with a lively, spice filled, plum and fennel personality. Medium bodied with a floral, plummy character, soft textures, sweet, black raspberries, licorice and a round finish that should be great on release. Easy drinking, forward, soft textured, cherry centered wine, with an espresso, licorice and red berry finish. Licorice tinged cherries and earth, forward, fresh, spicy, black cherry and herb notes with sweet cassis finish. Forward styled and already showing well, this plush, low acid, round, chocolate, boysenberry, truffle and black cherry filled wine is a lot of fun to drink. Coffee, coconut, black cherry and licorice scents open to a round, forward style of medium/full bodied wine that ends with a chocolate, fennel and black raspberry finish.